The pursuit of the dream bathroom. For some it is the re-creation of their favourite hotel bathroom. 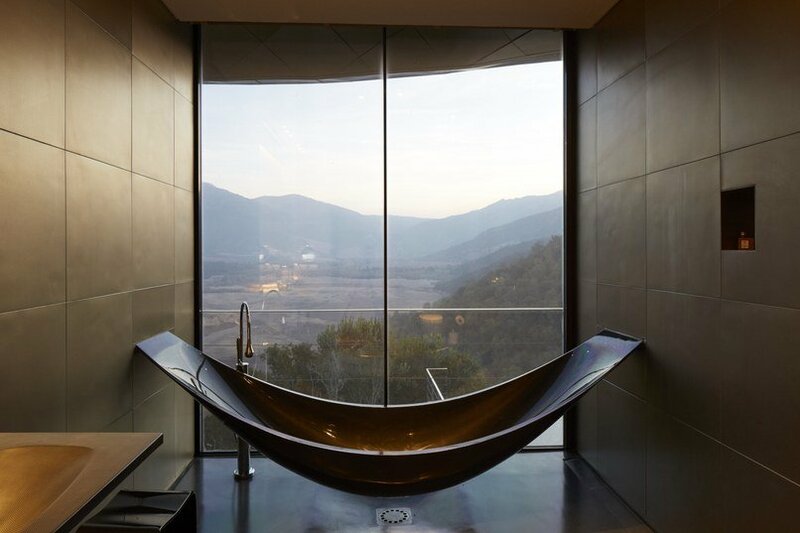 We have been eagerly scouting out the most beautifully designed hotel bathrooms across the globe and these are the three that made us swoon the most, and perhaps will inspire your own bathroom design. We are completely taken by the modernity of Santa Clara Hotel’s bathroom interior. The building is one of the few survivors of a catastrophic 18th century earthquake, meaning designer Manuel Aires Mateus had a unique opportunity to be inspired by the graceful, classical limestone shell and interpret the interior into something very contemporary but still in keeping with the building’s authentic elements. 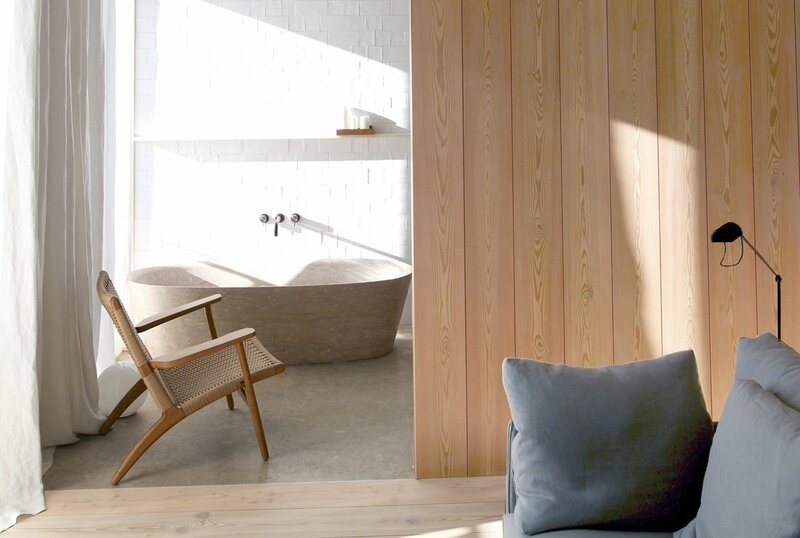 The utilitarian nature, designed to be suited to modern living, is softened by the choice of natural materials such as delicately draped linens, pale wood floor panels and most notably, the bath tub and sinks are carved from the gorgeous pinky-beige Lioz limestone found in Portugal. 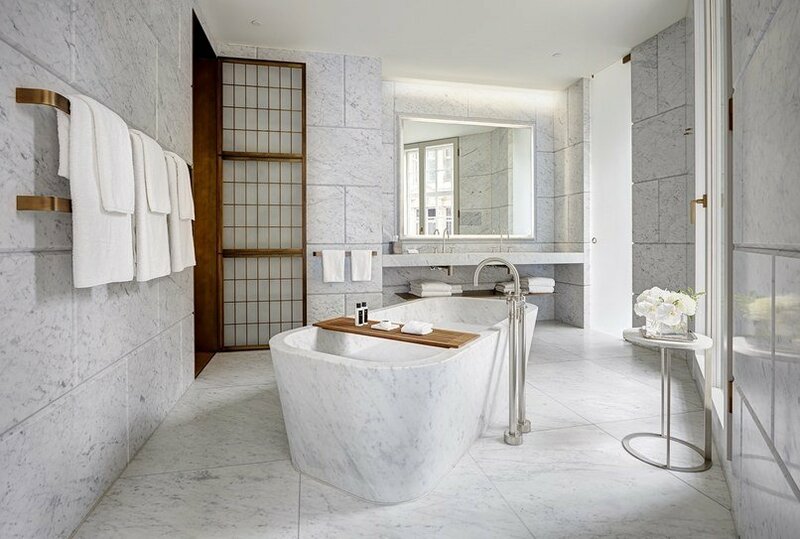 We move on to another hotel bathroom that centres around the choice to use natural elements in the interior but carries a very different aesthetic due to the diverse qualities and effects of varying stone finishes. The iconic Hotel Café Royal in London has had many elite guests pass through its doors, Elizabeth Taylor and Winston Churchill to name a few, and this is very much emulated by interiors that ooze luxury in their design, as well as the vast space available in the exclusive suites. The Royal Suite, for example, includes an indulgent four bathrooms made almost entirely of Carrara marble with flashes of copper in the bathroom accessories and door frame. The space is similarly minimalist to the Santa Clara 1728, but the choice to use these striking, bright and contrasting materials is more overt in its representation of luxury, as well as the marble’s historic connections to decadence. On a hilltop over-looking the Vik Vinyard, you will find the Hotel Vina Vik in Chile. Typically, we envision a bathroom to be white or light in colour as we’ve seen with the previous two bathrooms, but we chose this sanatory space as a representation of how darker tones can be used successfully, and still remain fresh and contemporary. 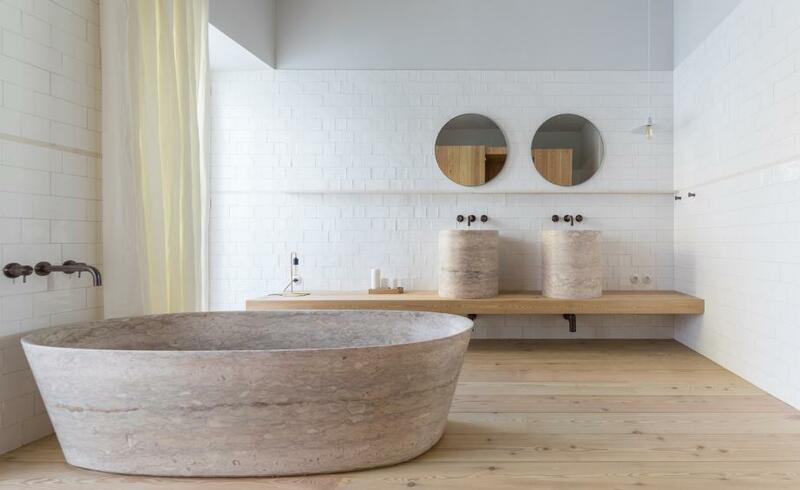 The bath tub is custom made by a UK manufacturer called Splinter Works, using lightweight carbon-fibre which enabled the shape to be slung from walls and off the ground to mimic the form of a hammock. Despite the man-made material choice, notice how the colours used reflect a natural palette of coppers and brass to indicate a sense of calm, and by replacing the entire outer wall with a glass panel allows in floods of light to prevent the darkness of the interiors from dominating.